Yesterday, Ben spent the better part of the day outside. First he helped my dad with yardwork, then he spent a few hours in the pool. He promptly fell asleep on the ottoman around 5pm. We attempted to wake him up for dinner but after much crying and fit throwing and him asking us to put him to bed, he went down for the night around 7pm without food. (Lest you think I am mean, we offered him everything possible to get him to eat, he refused.) Needless to say, he needed a more solid lunch today since he is quite the starving child after skipping one dinner. 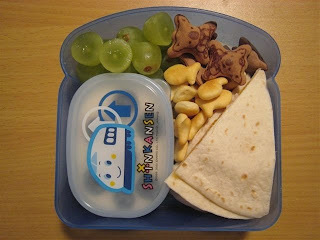 He took turkey & cheese quesadillas, parmesan Goldfish crackers, chocolate koala cookies, vanilla yogurt with blueberries and grapes. He also ate 3 bowls of cereal for breakfast and 3 helpings of roast chicken & potatoes for dinner. I think he made up for missing his meal. Please be aware that those Koala cookies from China have been recalled because of melamine-tainted milk ingredients! I had several packages that I had to throw away.